SPONSORED POST: I’ve partnered with Milk & Eggs, an amazing farm direct grocery delivery service, to bring you guys some delicious, super seasonal, and always healthy recipes a few times a month. I’m so excited to share some of my favorite dishes and health food products with you! What to feed my kid has become much more of a focus in my life than I care to admit. As a nutritionist, I am constantly worrying about little M eating healthy toddler meals with enough healthy fats, proteins, macronutrients and greens, but hovering over her every bite wasn’t doing either of us any favors. 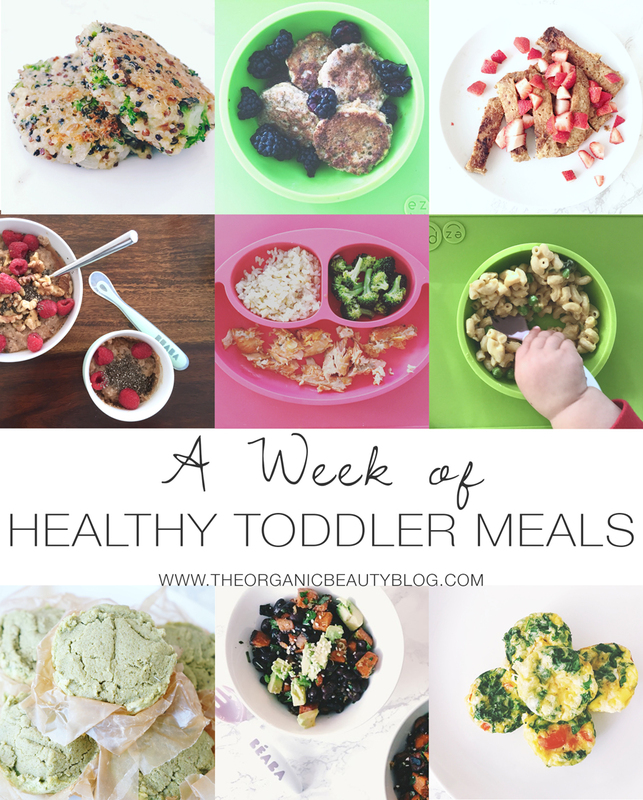 To get a real sense of how well your toddler is eating, look at what they eat over a two week period, instead of just day to day. What I’ve learned is that to really get a sense of how “well” a toddler is eating (in terms of fueling their bodies with healthy foods and building blocks for growth), you can’t look at just one day. Toddlers’ appetites naturally ebb and flow from day to day, and on a “bad” eating day, when they may just not be as hungry as normal, it’s easy to fall into the trap of becoming a short order cook and whipping up crowd-pleasing backup meals just to get our kids to eat. The problems with this approach are many and varied, but most notably, it sets a precedent that our kids get to call the shots (dangerous) and that it’s more important for them to eat something than something healthy (false). When we set aside the rejected healthy meal of salmon and broccoli and run to the kitchen to make some mac and cheese that we know they’ll eat, we aren’t honoring their own sense of what their bodies need in the moment and we show them that all they have to do is push away their plate of healthy food to get mom to make them something “fun.” This is a recipe for entrenching picky eating. When I let go of my desire to control what and how much little M eats, I noticed that she actually started eating SO much more healthy food. Her nascent finicky eating behaviors more or less disappeared, and mealtime became so much more enjoyable for us both. Now, even on those days when she only eats fruit and greek yogurt (yes, we have those days too), I keep calm and know that tomorrow or the next day, she’ll be back to devouring her plates of greens and beans and all things good. It’s your job to put HEALTHY food in front of your child at every meal, it’s their job to decide what and how much of that food they eat. Always make sure one thing at every meal is a healthy food they like (like fruit or a favorite veggie), so at least they eat something nutritious. If they reject the rest of the meal, that’s fine! No cajoling, no “one more bite,” and definitely no running back into the kitchen to make a backup meal. They’ll have another chance to eat at their next meal or snack. No child has every starved themselves. The less you show you care about how well they’re eating, the more they’ll eat, I promise! Make sure there is always something green on their plate at every meal. This gets them used to eating greens and avoids the dreaded mono-diet that some American kids develop. “Hiding” greens and vegetables in your kids’ food is a really dishonest way of getting them used to a broader palate, and does nothing to help them develop a love for healthy eating. And lastly, feed your toddler REAL food! “Kid” foods breed picky eaters, so steer clear as much as possible. Your toddler can (and should) eat what you eat! Ditch the puffs, pouches, kid crackers, etc. My philosophy around what I feed M is really simple: easy, no fuss, healthy foods, with a decent amount of variety in textures and flavors. I use all organic ingredients, and local, seasonal produce whenever possible. I have to say, my weekly grocery delivery from Milk & Eggs makes all of this SO much easier. No matter what, I know I’m getting a big box of local, organic produce (we use staples like greens, broccoli, berries, and citrus every single week), and can add on our other weekly basics like organic greek yogurt, organic raw cheese, free-range eggs, and sprouted whole grain bread so easily. To help introduce new foods, I try to pick one new organic veggie every week to bring into the mix every week, which I prepare a few different ways (steamed, roasted, sautéed), which helps her to integrate it. Remember, many babies and toddlers have to be exposed to a new food 10 times before they accept it! Nearly everything M eats (and almost everything in this week of meals) gets delivered to my door by Milk & Eggs straight from local farms. It’s really the perfect tool for us healthy-conscious, busy mamas! If you’re not in LA, find a local CSA or grocery delivery service.. it’ll save you SO much time and planning. As far as recipes go, I’ve got some basics that I come back to again and again, and some new fun recipes that I throw in the mix. I find that the more effort I put into a meal, the less interest she has in it, so the key for me is simplicity and ideally making meals (or components) that we’ll all eat. I’m also all about batch cooking, so I make a few things for the week, and then recycle them in different dishes for a few days. 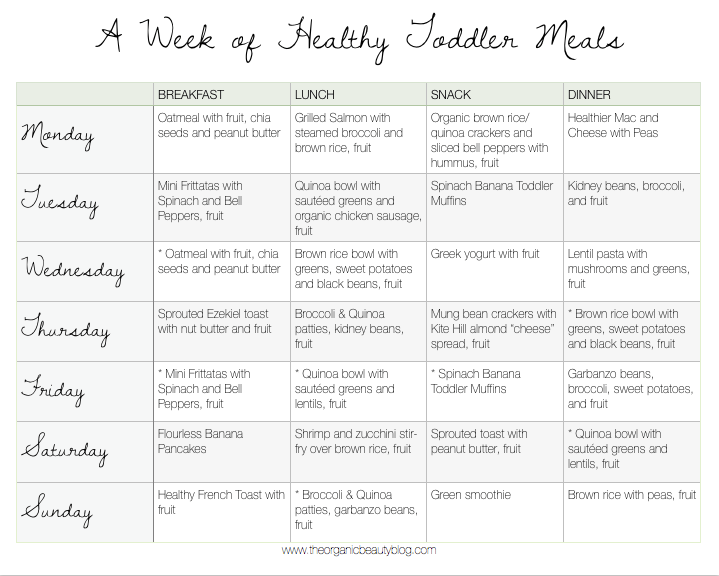 Below you’ll find typical week of meals for M, who is now 21 months old. This will work for toddlers and small children of any age. M has been eating like this pretty much since she started solids, as we went with the baby led weaning approach to feeding (more on how we started feeding her here). Really the only thing that’s changed is the size of pieces she eats. For this week of meals, I made the quinoa and brown rice ahead of time on a Monday, made the Green Toddler Muffins on Sunday, and already had a batch of the Broccoli Quinoa Patties in the freezer from a previous week. Any time I cook a veggie (like steamed broccoli or sweet potatoes), I make extra and keep it in the fridge for future meals. I use organic, low sodium canned beans and legumes, which I alternate so she’s not stuck eating the same type of bean all week. And I always have healthy whole grain or nut crackers, organic “dips” and a variety of fruit on hand for snacks and to round out meals. Most of these meals don’t require a recipe — they’re just thrown together quickly and easily from components that I’ve already prepared (like whole grains) and foods I have on hand. I never spend more than 20 minutes cooking, and for most meals, it’s more like 5. I always add a healthy fat (olive or coconut oil or grass-fed butter) and some seasoning to M’s lunches and dinners (Gomasio, Trader Joe’s 21 Seasoning Salute, Nutritional Yeast, or organic herbs are what we use most) to keep things flavorful. So for example, the “bowls” that she eats all the time are pretty much just a whole grain, protein, greens and/or veggies with some olive oil and seasoning. Easy peasy. I’ve included recipes for the meals that are more a little more involved or have more ingredients. 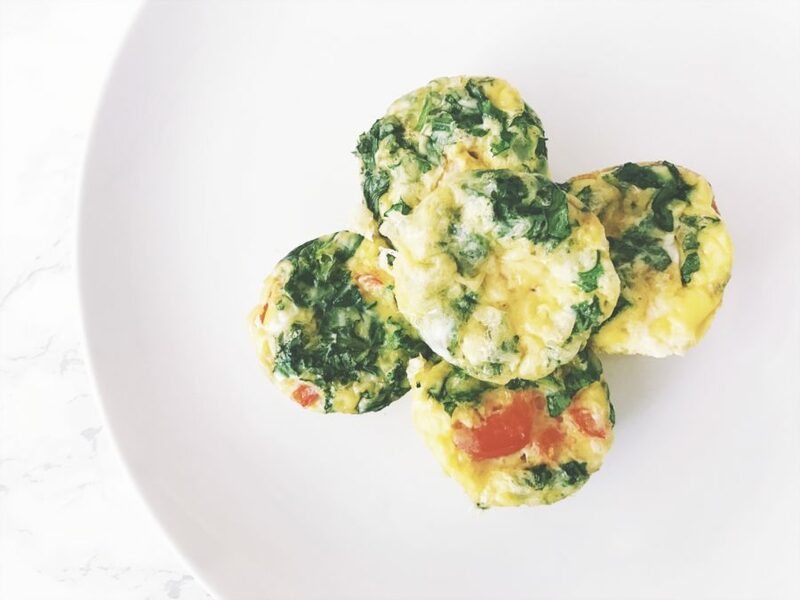 These delicious mini frittatas are a breeze to make, keep wonderfully in the fridge, and are a crowd pleaser for the whole family, even the littles! Spray a mini muffin tin with olive oil. Beat together the eggs, salt and pepper. Fill the muffin tin evenly with a mixture of the veggies and cheese, and fill with the eggs right up to the rim. Serve warm or refrigerate. Reheat briefly at 325º. Heat the coconut oil in a large cast iron pan. Mash the banana in a small bowl. Ladle the batter into the pan -- I like silver dollar sized pancakes for my little, and full sized pancakes for me. Cook about 3 minutes per side. Serve with fruit or a sprinkle of unsweetened coconut flakes. Heat a large skillet (I like to use cast iron) over medium heat, and add coconut oil. One by one, soak the slices of bread and place them on the skillet. Cook until lightly browned, about 3 minutes on each side. Arrange on two plates and top with sliced berries. If serving to a toddler, cut into hand-size strips. You can top with a sprinkle of shredded, unsweetened coconut! Cook quinoa according to package instructions. Let it cool. While the quinoa is cooking, sauté the onion over medium heat until translucent. Transfer to a medium sized bowl to cool. Add more olive oil to the pan and cook the broccoli florets until it's softened a bit. Let it cool and then chop it up. Add to the onions. Add the cooked quinoa to the broccoli and onions. Mix in the shredded cheese, and breadcrumbs. Add the egg and mix well. Season with salt and pepper to taste. Heat up some more olive oil in your pan. Make 1/4 cup sized patties out of your mixture, and place on the pan. Cook over medium heat for about 7-8 minutes per side. Do not allow the patties to burn! To freeze, wrap uncooked patties in plastic wrap and place in a ziplock freezer bag. Defrost in the fridge and then cook as directed above! Optional add-ins: beans and/or sweet potatoes are some of my faves to mix things up! If you add beans, these patties become a complete meal. 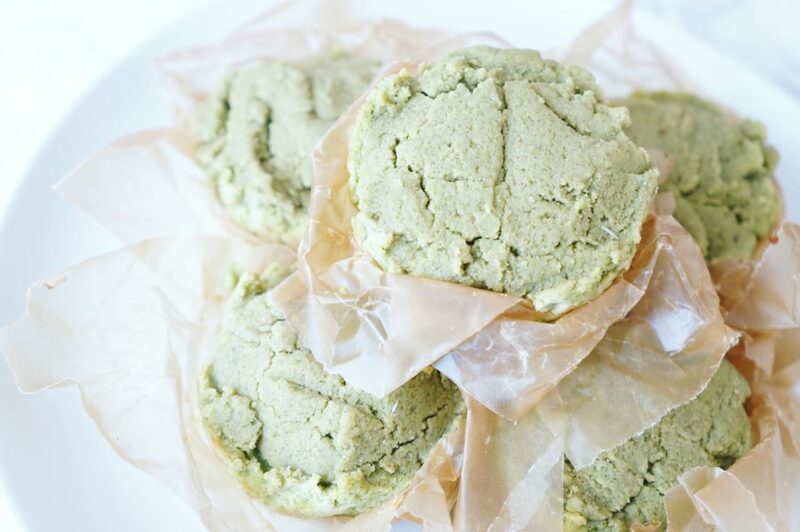 These delicious muffins are a great way to get some nutrient-packed greens into your baby or toddler -- the addition of just the right amount of fruit makes them a bit sweet, to satisfy even the most picky of palates. You can customize this recipe to suit your needs -- adding other veggies like zucchini or carrots, decreasing the fruit and adding some herbs to make them more savory, etc. Steam your broccoli florets until they're soft. Add steamed broccoli to the remaining top 7 wet ingredients in a food processor and process until smooth. In a bowl, combine the remaining dry ingredients. Add the wet ingredients to the dry, and mix with a spatula until combined. If necessary, add a splash of almond or coconut milk to loosen the batter up a bit. It will definitely be thick! Spoon the mixture into a lined muffin tin (I like to use unbleached natural parchment muffin liners). Bake for 20 minutes (or 15 minutes if you're using a mini muffin tin), or until a toothpick inserted into the center of a muffin comes out clean. Serve with some beans or other protein on the side to make a complete, nutritious toddler/baby meal! These muffins work great for baby-led weaning. Some babies will do just fine tackling the muffin whole, while others may need it cut in half. This recipe is basically like a choose-your-own-adventure. You can make it vegan, gluten-free, dairy-free, none of the above, or some combination of the four. Using the veggies, organic, grass-fed, raw cheese, coconut milk, and bone broth makes the non-vegan version way healthier, and just as yummy as the less healthy alternative. And of course, the vegan option is absolutely delish! Cook the pasta according to package instructions. Then drain and set aside. You can add bone broth to the pasta water (I like to dilute 50/50) to get even more bone broth goodness into this recipe. While the pasta is cooking, bring the 5 cups of bone broth to a boil and add the cubed squash. Cook for about 7 minutes, or until fork tender. Drain and reserve all the bone broth. You'll use some in this recipe, and the rest can be reused in a different recipe or just enjoyed sipped from a mug. Transfer the squash to a high speed blender, with 1/2 cup of the reserved bone broth, the coconut milk, and the salt. Blend on high until completely smooth and creamy. Pour the sauce over the macaroni, and add the shredded cheese and peas, if using. Mix until the cheese is melted, adding a bit more of the reserved bone broth if necessary to reach your desired creaminess. Wait for the oohs and aaahs from your littles! Boil the squash in water instead of bone broth, or drizzle with olive oil and roast it in the oven at 400º for about 50 minutes. Add the squash, 1/4 tsp black pepper, 3 Tbsp nutritional yeast, 1/2 tsp paprika, 1/4 tsp sea salt, 1/4 tsp onion powder, 1/2 tsp dried herbs of choice (herbs de Provence or Italian herbs work nicely here), and 2 1/2 cups organic coconut milk to your blender. Blend until smooth and creamy. Pour over macaroni and add peas. L.A. Mamas: Want to try Milk & Eggs for your self? Cooking with Bone Broth.. and why you should use it!